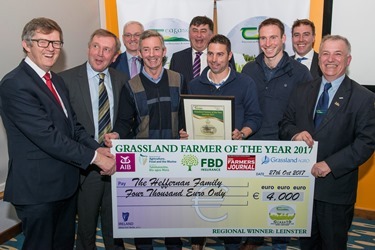 PastureBase Irelands website for LIVE daily Grass growths in every county in Ireland. The number 10 refers to the fact that the target should be to graze each paddock on your farm 10 times during the year and utilise 10t of grass dry matter per hectare per year. These Grass10 targets effectively mean the target for grassland paddocks must be to grow 12t to 13t of grass dry matter per hectare per year. Then it is up to sheep, cattle or dairy cows to eat upwards of 70% of the amount grown and convert it into meat or milk protein. Across Irish farms, the current average amount of grass grown is down around 7t of dry matter per hectare. 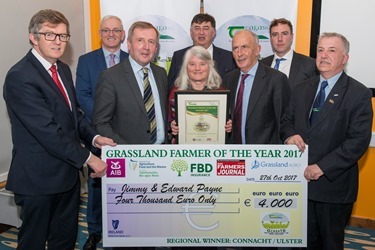 However, many well fertilised farms are averaging well above 12t of grass DM grown once soil fertility, drainage and grass species are improved. Eddie O’Donnell and his father Denis farm 116 hectares outside the village of Golden in south Tipperary. In 2017 they milked 318 cows giving a stocking rate of 2.75cows/ha on the milking blocks. There is excellent grazing infrastructure with 5m wide roadways and two 300 gallon water troughs in each paddock. Eddie’s goal is to grow enough grass to stock the herd at 3cows/ha and to porduce enough winter feed from within the system. Farming in Kilnamartyra, Macroom, Co Cork Gerard is a suckler farmer finishing all bulls to beef. In 2017 he had 60 cows and 15 in-calf heifers. He farms full time on 31ha, 10ha of this is an out farm. Farm output is high at 999kg liveweight per hectare. He finishes bulls using 1.2t of meal, this is less than half of what he used before he started measuring grass. 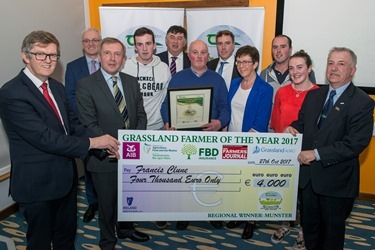 Peadar is farming 27ha of good land in two blocks at Tallanstown Co. Louth. The home farm is 10ha and there is a leased outfarm of 16ha. In 2017 he had 330 ewes, giving a stocking rate of 12.2 ewes/ha. 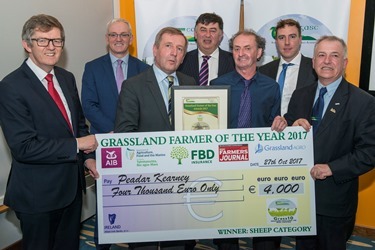 This year Peadar expects to have a surplus of silage, this is a big change from four years previous when he bought in all his silage. 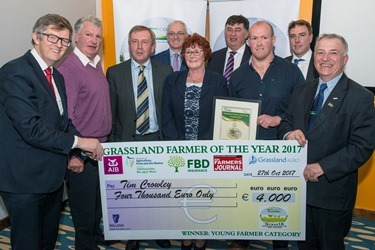 This excellent turnaround is due to the serious focus he has put on growing more grass. 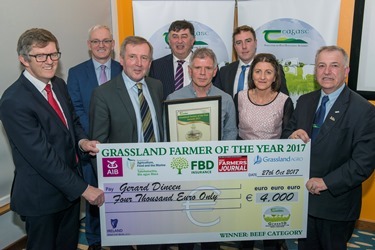 In 2016 15.5t/ha of grass was grown on the farm.